The conference championships are over and the field is set. The tournament is not filled with as many automatics as in the past and there are a number of teams that could pull upsets. The numbers ones are fallible and the number twos have been beaten by teams that did not make the tournament, but that is the best thing about the competitive field. Starting with the snubs, each of the teams that missed out were only a win or two away from making the field. Maryland had two big wins over Duke and a home win against NC State, but fell three times to UNC and had a very weak non-conference schedule. A win over Kentucky at the beginning of the season and an extra road win in conference would have been better. Virginia had a slightly better placement in the conference and a win over Duke, but their RPI and SOS were also too high. Tennessee may have had the closest argument but failed to get a strong enough record in a weak SEC. Alabama and Kentucky both missed key opportunities in their conference in both the top-50 representatives and early in the conference tournament. Southern Miss is just not in a great conference and lost to Memphis three times, missing a chance to at least take advantage of a power within the conference. Midwest: Anchoring this region is Louisville, the #1 team of the tournament. With a possible late matchup against Duke, there is a lot of talent in this group. The bulk of the teams in this region seem to be more from the Mid-Majors. Creighton can always be a dangerous team but Memphis is the team to watch out for. The easy prediction would be to say that Louisville can make it out of this region with little challenge. Duke will have to get past both of the Mid-Major powers but will likely not meet up in the region final. There are a number of teams that are vulnerable in this region for beating each other up before meeting with the top 2. Saint Louis and Michigan State are likely upsets early but could make a move if they get a little momentum. Look for Louisville to make the most of their last season in the Big East with more than a conference championship. West: Originally thought to be the outright #1 team, Gonzaga still made it to the big dance with a big position. As the only Mid-Major to get a spot in the top 3 of any region, their road is going to be tough, with possible match-ups with Pitt and Wisconsin before likely meeting Ohio State. Kansas State could be the buster of this region, though Wisconsin/Ole Miss will not be an easy out before meeting the Zags. Notre Dame and Arizona could also be dangerous if they get hot quickly. The top teams in this conference do not have much to worry about as the bottom half are easy outs overall. The strongest team to possibly pull an upset would be Ole Miss, but Gonzaga will likely match up with the Buckeyes or Wildcats as their biggest match-ups. East: Originally sitting at the #1 spot at the start of the season, Indiana is poised to make quite the run. Losing out in their conference semifinal, Zeller and company will be looking for redemption and will have to get passed a couple of teams that really show up come tournament time. Marquette, UNLV and Syracuse are not going to make things easy for Indiana or Miami. In particular, the Orange will look to avenge their conference championship loss with a strong run in the tournament. Probably surprised that they were skipped over for a #1 spot, Miami will be looking to make a statement with a fairly veteran lineup that has been very dangerous. NC State and Butler will also be looking to push against this group, but Indiana will probably rise to the occasion. It may be tempting to pick an upset with Montana and Davidson for their previous success but these are not the same teams. South: Poised to be the toughest of the regions to get through, Kansas is likely to be in for a real test. After they get passed WKU, they will likely face UNC and have trouble with the 4-guard/shooter lineup. Michigan and VCU will likely make a push as well and face a tough Jayhawk team after a few days rest. On the other half of the region, Georgetown, Florida and UCLA are poised to avoid the early round upsets and meet up with either the Jayhawks, Tar Heels, Rams or Wolverines in the regional final. This is the most exciting region with possible match-ups including UNC-Villanova, Kansas-UNC, Georgetown-Florida, Michigan-VCU and VCU-anyone, if they can get some momentum. Likely bracket busters include Creighton over Duke (#7 v. #2), New Mexico State over Saint Louis (#13 v. #4), Oregon over Oklahoma State (#12 v. #5), UNC over Kansas (#8 v. #1), Colorado over Illinois (#10 v. #7) and Ole Miss over Wisconsin (#12 v. #5). 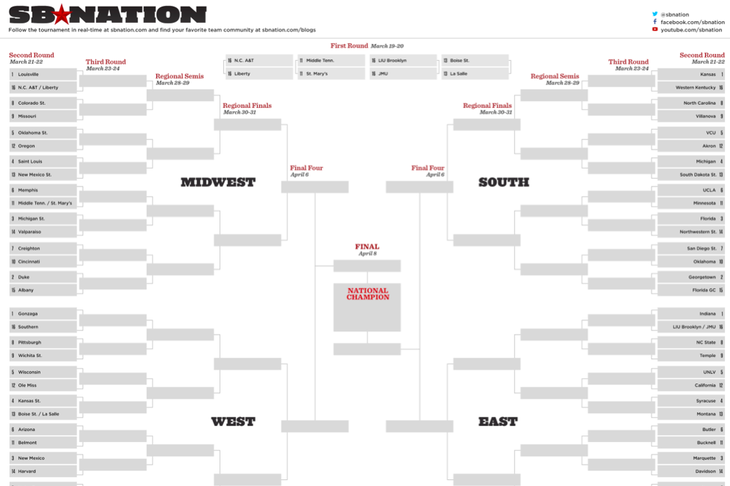 The final four is really tough to predict this year, though it is the top half of each region that could fluctuate and all of the #1s and #2s are vulnerable to a tough slate of teams. The finals will probably be Indiana versus Louisville with the Hoosiers claiming their final place atop the college basketball landscape.